Extended abstracts and field-trip guide for the symposium held February 13 through 16, 1997, Nashville, Tennessee. Ira D. Sasowsky, Daniel W. Fong, and Elizabeth L. White, Eds., 1997, Conservation and Protection of the Biota of Karst. Extended abstracts and field-trip guide for the symposium held February 13 – 16, 1997, Nashville, Tennessee. 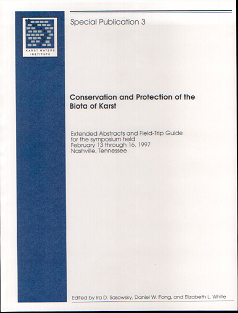 Karst Waters Institute Special Publication 3, Karst Waters Institute, Charles Town, West Virginia, 118 p.